Work on Billings Place, a 65-unit, five-story apartment building in Royal Oak, now is underway. 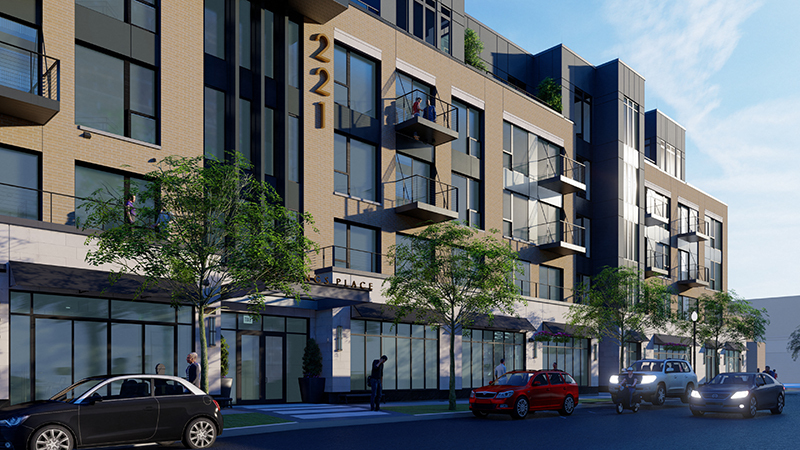 The $25-million-to-$30-million development will be located at 221 N. Main St., just north of 11 Mile Rd., and is scheduled for completion in fall 2020. The complex will offer one-, two-, and three-bedroom residences, including eight penthouse units. Each will have stainless steel appliances, floor-to-ceiling windows, and high-speed internet. Community spaces will include a fitness center with a yoga studio, a media/theater room, an outdoor sky terrace with fire pits and grills, a lounge recreation room, secure bike storage with a repair area, a heated parking garage, electric vehicle chargers, and an on-site concierge. The Royal Oak City Center, which is near the location, will include a new Henry Ford Health System building, city hall, police station, park, and 581-space parking deck, slated for completion in 2020. Renderings and floor plans for the apartments will be available when pre-leasing begins in summer 2020. Additional Billings Place team members include Kreiger Klatt Architects, Tower Construction, and Huntington Bank.